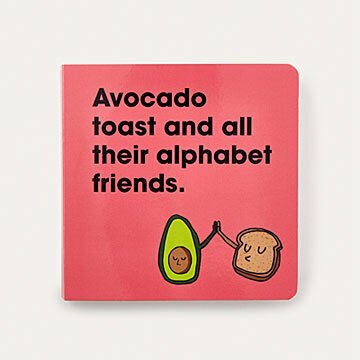 This ABCs board book teaches kids the hippest version of the alphabet while giving parents a chuckle. Yes, A is for apple, but some parents prefer an edgier fruit. Hip mamas and daddios bringing up baby with knowledge you probably haven't heard of will get a kick out of this colorful ABCs book. (While the little one learns the alphabet, of course.) From Avocado to Zombie, with stops along the way for Obama, Vegan, and Yoga, the board-style pages introduce kiddos to fun vocabulary words that will give parents a chuckle, too. (Remember, Margaritas are for mommy and no Netflix and chill until you're a grown up.) Made in China. Don't eat! or try not too... it's OK if you do. Just buy a new one.